3D printer improvements: How to run a (Cura) Python plugin on STL files without Cura? How to run a (Cura) Python plugin on STL files without Cura? 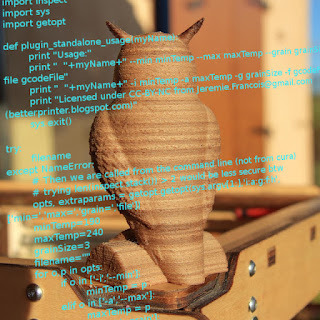 Here is a geekier post about how to tweak Cura plugins and convert them to standalone Python scripts that post-process your g-code without Cura nor Skeinforge. After I designed and used my wood gradient plugin, people naturally started to ask for the source code. I was a bit lazy first, because it was made for Cura 12.08: the patch I released was not very convenient, and Cura had evolved with a better and simpler plugin system, and included my own plugin. Then, I got the time to fix it. Here is how I converted it to a standalone Python script that runs on its own, asking nothing to nobody. The way I did it may be of interest to a (very) few people out there, and it is the subject of this post. What is the use for a standalone g-code post processor? Indeed, imagine you see an interesting plugin for Cura that you would like to run from another slicer, or to automate within a special process (eg. with a matlab script that generates gcode directly). The most portable way is then to run your gcode through a console-based plugin, without the interface and need for other software around it. Actually, my original wood plugin for Cura & Skeinforge was a bit tricky to write, as it did require multiple and somehow ugly required code patches in both programs. With Cura 12.10, Daid finally designed a much simpler post-processor plugin system, and he ported my plugin to it (it even was the first third-party plugin, in Cura 12.11). He did well, since I was too lazy to go back and check if it would rune as a pure Skeinforge plugin to fulfill some of my requests. Since the work was almost done, here is how I took it over again and made it a pure Python script. What may be more interesting even is that, as of today (2013-02-11, Cura v12.11 and above), the same approach would probably make any other Cura post processing plugin a standalone Python script as well. When you open the wood plugin from the "plugin" directory of Cura installation folder, you'll get something like the following. Writing a new plugin for Cura is outside the scope of this post, and is already well documented on the official website. As you can see, the plugin parameters are clearly listed after the Param: prefix. In a standalone script, we want them to come from parameters on the command line, not from the Cura context. The other missing information in the script is the g-code filename which is obviously needed. # postprocessing of a gcode file, so as to insert the temperature commands at each layer. # Also it is still viewed by Cura as a regular and valid plugin! # It will "patch" your gcode file with the appropriate M104 temperature change. print " "+myName+" --min minTemp --max maxTemp --grain grainSize --file gcodeFile"
print " "+myName+" -i minTemp -a maxTemp -g grainSize -f gcodeFile"
print "Licensed under CC-BY-NC from Jeremie.Francois@gmail.com (betterprinter.blogspot.com)"
As you probably understood, the plugin_standalone_usage()function is optional. It simply prints some usage information in the console when the caller provides no parameters (or when he only use the -h or --help option). As a side not, the way I wrote it makes the plugin compatible with Cura. IMHO such double usage would be something useful for other Cura plugins. The second parameter given to the getopt() function is important: the weird character string i:a:g:f:h means that the script understand all of these single-letter parameter. When a letter is followed by a colon, it means that a value is also expected after the option. Else it is a just a flag with no value (such as the -h option). The third parameter to getopt() is the parameter long-name variants, with a similar syntax. One compulsory and common parameter is of course the filename, which is the g-code file to process. Finally, you will need to write what to do with the parameter, in the for o,p in opts: loop. Do not forget to use float(p) to convert the argument (a string) into a number when it is needed! You will have to provide default values for your options, else you probably want to add more tests in the end of the block. Here we only require that filename is explicitly provided. Look for Python syntax on the web if you need more conditionals, the language is easy to learn and very well documented. Don't forget the colon after a conditional statement and respect the strict indentation and you are done. Finally, how to run the Python script? Note: if you are running windows and you are getting issues with the command line, you will find answers in the python FAQ. Running the script on your frog will "patch" the g-code file in place, with the appropriate M104 temperature change. Keep a backup of the original file, and try not to run the script several time on the same file as it would clobber the code with many useless M104 (no big harm though). The script itself is published on thingiverse. It also show the temperature graph in a better way. +1 for blog posts with "interest to a (very) few people"! Thanks Jensa, I did not know it could be harmful, but it makes sense indeed... Will react faster next time.